I know that those of you who have suffered through the polar vortex will find our Northern Californian mewling wimpish but it has been cold (for here) and rainy for four days! And much like when we lived in much colder Massachusetts when there is a break in the weather, we fire up the grill! Hamburgers on the grill taste especially good in the middle of winter. John prepares the 80/20 ground beef with salt and a pinch of baking soda which helps to keep the meat juicy. Minimal handling keeps the ground beef from turning into meatloaf and tapered edges gives you some extra crispy bits. I made a simple dressing of oil, vinegar, sugar (or sugar substitute), salt, dry mustard, celery seed, lemon juice, and grated onion. The dressing sat on the broccoli florets and peeled stem pieces for an hour or so before serving. A reminder of warmer, sunnier days always lifts my spirits! 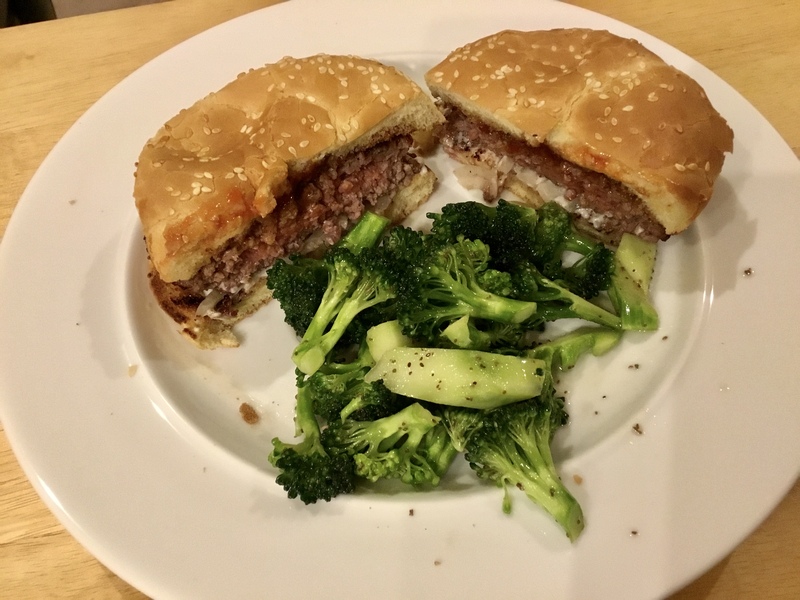 This entry was posted in American, Beef, Easy, Grilling, Vegetables and tagged broccoli salad, Grilling, hamburgers. Bookmark the permalink.